The young ones of tall trees can be quite difficult to identify or link to the parent trees because all they showcase are just leaves. 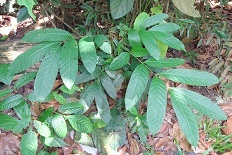 Though leaves may look different among plants, there are also many plants with similar-looking leaves. In addition, leaves from baby trees may look very different from the ones on their parents. Trying to identify a plant just by the leaves can be a futile exercise, especially if you have little knowledge of the local flora. Let me shared 3 baby trees from my recent park walk. 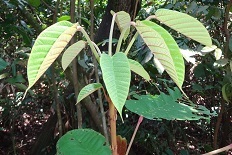 Swietenia macrophylla is a commonly tree planted in parks or open areas. There was a whole book written on it in 2016 by a local author. 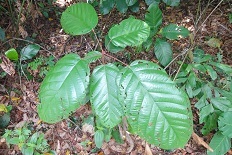 The tree has compound leaves with around 8 large leaflets per leaf. 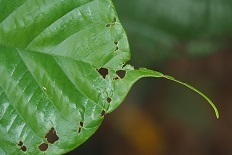 Each leaf ends with a pair of leaflets at its terminal end. 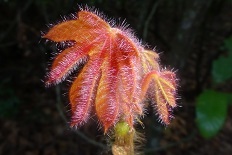 The most distinctive feature of the young plant is the red coloured young leaves. 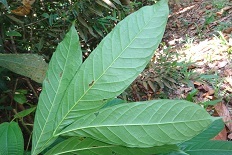 While the leaf blade of the leaflets on matured trees are asymmetrical, it is not the case in the young plant. 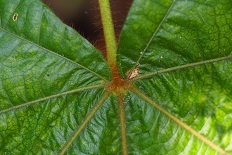 This long leaf stalk, large leaf baby tree took me quite a while to link it to its parent tree --- Sterculia cordata. 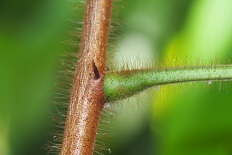 The uncertainty was due to the characteristic of the leaf tip. 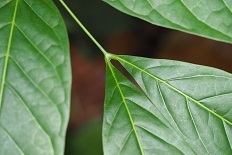 In the young tree, the leaf tip is unusually long while this feature is absent on the leaves from the adult tree. 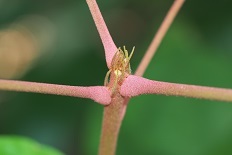 Another prominent feature of the young tree is the pink coloured leaf stalks. I am quite certain that this young plant belonged to Sterculia foetida though I was not able to find any other reference pictures from the Internet. 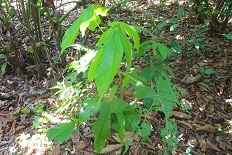 The red coloured young leaves are palm shaped with dense long hairs. In fact, most parts of the plant are covered with hairs. 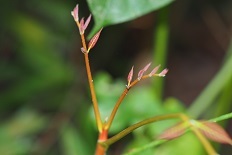 Leaf stalks are relatively long. I may share more of these baby plants in my future posts. As the saying goes: "When the student is ready, the teacher will appear". This link may actually change your life forever if you are ready.